Child marriage (before 18 years) is prevalent in Pakistan, which disproportionately affects young girls in rural, low income and low education households. Our study aims to determine the association between early marriage and high fertility and poor fertility health indicators among young women in Pakistan beyond those attributed to social vulnerabilities. Nationally representative data from Pakistan Demographic and Health Survey, 2006–2007, a cross-sectional observational survey, were limited to ever-married women aged 20–24 years (n = 1,560; 15 % of 10,023) to identify differences in poor fertility outcomes [high fertility (three or more childbirths); rapid repeat childbirth (<24 months between births); unwanted pregnancy (any ever); pregnancy termination (any stillbirth, miscarriage or abortion ever)] by early (<18) versus adult (≥18) age at marriage. 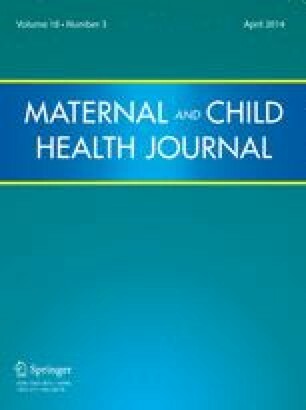 Associations between child marriage and fertility outcomes were assessed by calculating adjusted odds ratios (AORs) using logistic regression models after controlling for demographics, social equity indicators (education, wealth index, rural residence), contraception use, marriage duration and culture-specific factors (husband’s desire for more children, son preference). Overall, 50 % of ever-married women aged 20–24 years in Pakistan were married before the age of 18 years. Girl child marriage was significantly (p < 0.001) associated with low social equity indicators (poverty, rural residence, and no formal education). Adjusted logistic regression models showed that girl child marriage was significantly associated with high fertility (AOR 6.62; 95 % CI 3.53–12.43), rapid repeat childbirth (AOR 2.88; 95 % CI 1.83–4.54), unwanted pregnancy (AOR 2.90; 95 % CI 1.75–4.79), and pregnancy termination (AOR 1.75; 95 % CI 1.10–2.78). Girl child marriage affects half of all ever-married women aged 20–24 years in Pakistan, and increases their risk for high fertility and poor fertility health indicators, highlighting the need of increasing the age of marriage among women in Pakistan. Efforts to eliminate girl child marriage by strict law enforcement, promoting civil, sexual and reproductive health rights for women can help eliminate girl child marriage in Pakistan. The funding agencies in this study have no role in the design and conduct of the study; collection, management, analysis, and interpretation of the data; and preparation, review, or approval of the manuscript. Dr. Raj’s involvement in this study was funded through her grants from the David and Lucile Packard Foundation (2011-37366 PI: Anita Raj) and the National Institutes of Health (R01HD061115 PI: Anita Raj). The demographic health survey procedures included in the study were approved by ICF Macro International institutional review board and the ethics review board of government of Pakistan. Because this manuscript involved secondary data analysis of a publically available dataset, ethical approval from our respective institutions was not required. All study authors were granted access to these data for the purpose of manuscript development. United Nations Children’s Fund (UNICEF). (2005). Early marriage: A harmful traditional practice. [Cited 2011 November 1]; Available from: http://www.unicef.org/publications/files/Early_Marriage_12.lo.pdf. International Council for Research on Women (ICRW). (2007). New insights on preventing child marriage: A global analysis of factors and programs. [Cited 2011 November 1]; Available from: http://www.icrw.org/files/publications/New-Insights-on-Preventing-Child-Marriage.pdf. United Nations Population Fund (UNFPA). (2009). Fact sheet: Young people and times of change. [Cited 2012 January 15]; Available from: http://www.unfpa.org/public/home/factsheets/young_people. United Nations (UN). (2011). The millennium development goals report 2011. [Cited 2011 December 23]; Available from: http://www.un.org/millenniumgoals/pdf/(2011_E)%20MDG%20Report%202011_Book%20LR.pdf. United Nations Population Fund (UNFPA). (2007). Study report, child marriage in Pakistan: A taboo. [Cited 2012 11]; Available from: http://floods2010.pakresponse.info/LinkClick.aspx?fileticket=CtHaS_yaaR0%3D&tabid=228&mid=1739. Sathar, Z. A., Ul Haque, M., Faizunnissa, A., Sultana, M., Lloyd, C. B., Diers, J. A., et al. (2002). Adolescents and Youth in Pakistan 2001–2002: A nationally representative survey, UNICEF and Population Council, Islamabad, 2002. [Cited 2011 November 19]; Available from: http://www.popcouncil.org/pdfs/ayp0102.pdf. IRIN Humanitarian News and Analysis. (2006). PAKISTAN: Child marriages on the rise across rural Sindh. [Cited 2012 January 22]; Available from: http://www.irinnews.org/report.aspx?reportid=33985. United Nations Children’s Fund (UNICEF). (2001). Early marriage: Child spouses. [Cited 2011 December 27]; Available from: http://www.unicef-irc.org/publications/pdf/digest7e.pdf. United States Agency for International Development (USAID). (2011). Women’s empowerment in Pakistan: A scoping study, Gender Equity Program (GEP) of Aurat Foundation. [Cited 2012 January 16]; Available from: http://www.af.org.pk/gep/deskStudies/Women_s%20Empowerment.pdf. United Nations Children’s Fund (UNICEF). (2011). Child info: Monitoring the situation of children and women. [Cited 2011 December 27]; Available from: http://www.childinfo.org/marriage_countrydata.php. Lane, S. (2011). Stealing innocence: Child marriage and gender inequality in Pakistan, Plan Finland. [Cited 2011 December 28]; Available from: http://www.plan.fi/File/197245fc-8b02-4abe-8868-54cd5e6a5497/Stealing+Innocence.+Child+Marriage+in+Pakistan+%28Plan+2011%29.pdf. Child Marriage Restraint Act, 1929. [Cited 2012 January 21]; Available from: http://www.vakilno1.com/saarclaw/pakistan/child_marriage_restraint_act.htm.